If there's no gluten, what's in it? It is hard to trust a title that is gluten-free because that doesn't mean its healthy for you. My product reviews will take not only the gluten-free aspect into consideration, but the overall healthiness of the products. Ingredients: Udi's Blend (Tapioca & Potato Starch, Brown Rice & Teff Flour, Modified Tapioca Starch), Water, Non-GMO Vegetable Oil (Canola or sunflower or safflower), Egg Whites, Evaporated Cane Juice, Tapioca Maltodextrin, Tapicoa Syrup, Yeast, Flax Seed, Xanthan Gum, Salt, Baking Poweder (Sodium Acid Pyrophosphate, Sodium Bicarbonate, Corn Starch, Monocalcium Phosphate), Cultured Corn Syrup Solids (Natural Mold Inhibitor), Dry Molasses, Enzymes. First off, wow that's a lot of ingredients! Now lets break down these ingredients we have the starches of course and then water. Now we have oil, yes other oils are much healthier than vegetable oil, but its not terrible. There are egg whites, and then what is this, evaporated cane juice? According to Processed Free America, evaporated cane juice is another term for sugar (The Truth). If you count the "Udi's Blend" and the "Vegetable Oil" as one ingredient, evaporated cane juice (sugar) would be the fifth ingredient. That would mean it is the fifth most used ingredient in the loaf of bread...wow..."healthy"! (note sarcasm) Maltodextrin is made from real foods, but is still a processed additive to thicken food or be a filler (What is Maltodextrin). Tapioca Syrup is a natural sweetener (healthier than many other sweeteners), but nonetheless it is a sweetener (LaFleur)..I mean is this sweet bread or something? Why do they need all these added sweeteners, why can't they just make it simple how bread is supposed to be? Yeast is okay and flax seed (although against paleo diet) flax seed is a great ingredient because of its many health benefits including reducing the risk of cancer, stroke, heart disease and diabetes (Column). There is xanthan gum which is "a long chain of three different forms of sugar" (LaFluer). Salt is salt and baking powder is baking powder..at least I thought.. Cultured Corn Syrup Solids...now that's a mouthful..It is practically solid corn syrup which is glucose and dexterose (forms of sugar) (Sandhyarani). Then you have molasses which is ok...better than butter, but not exactly healthy for you. (http://dogtorj.tripod.com/id110.html) (http://guide.thesoftlanding.com/the-dangers-of-corn-in-your-childs-diet/). People don't need sugar and corn in their diets because they have no nutritional value. The only valuable thing to eat in this "whole grain" bread is the flax seeds...So ditch the bread and go buy a bag of flax seeds (you can add them to your cereal, your veggies, your meat, or pretty much anything). Wow!! First off, I would like to thank Julian Bakery for sparring me some time with their short ingredient list! Now for the ingredients..water, no problem there. Gluten free oat fiber is just the fiber part of an oat which "is essential for a healthy digestive system and may also help lower your risk for heart disease and diabetes" (Oat Fiber & Nutrition). Egg Whites are very healthy for you and a good source of protein. Psyllium..What is psyllium? According to the University of Maryland Medical Center, psyllium is an all natural soluble fiber that can help lower cholesterol (Psyllium). Next is Organic Extra Virgin Olive Oil which has been proven to help heart health and then comes Organic Apple Cider Vinegar which has many health benefits including helping with acne, allergies, diabetes, heartburn, etc. (Apple Cider Vinegar). And lastly we have the good old baking soda again. "Apple Cider Vinegar." About.com Alternative Medicine. N.p., n.d. Web. 20 June 2012. <http://altmedicine.about.com/od/applecidervinegardiet/a/applecidervineg.htm>. Column, Elaine Magee, MPH, RDWebMD Expert. "Flaxseed Health Benefits, Food Sources, Recipes, and Tips for Using It." WebMD. WebMD, 03 Jan. 0000. Web. 20 June 2012. <http://www.webmd.com/diet/features/benefits-of-flaxseed>. "Julian Bakery, Low Carb, Gluten Free, Wheat Free." Carb Zero Bread â€“ Regular (0 Net Carbs) (Gluten Free). N.p., n.d. Web. 20 June 2012. 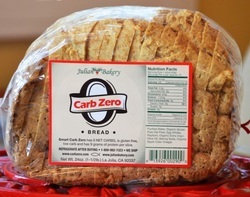 <http://www.julianbakery.com/bread-product/carbzero-regular/>. LaFleur, Christine, and A. Joseph. "What Is Tapioca Syrup?" WiseGeek. Conjecture, n.d. Web. 20 June 2012. <http://www.wisegeek.com/what-is-tapioca-syrup.htm>. "Oat Fiber & Nutrition." LIVESTRONG.COM. N.p., n.d. Web. 20 June 2012. <http://www.livestrong.com/article/292050-oat-fiber-nutrition/>. "Psyllium." University of Maryland Medical Center. N.p., n.d. Web. 20 June 2012. <http://www.umm.edu/altmed/articles/psyllium-000321.htm>. Sandhyarani, Ningthoujam. "Corn Syrup Solids." Buzzle.com. Buzzle.com, 18 Feb. 2011. Web. 20 June 2012. <http://www.buzzle.com/articles/corn-syrup-solids.html>. "The Truth About Evaporated Cane Juice." The Truth About Evaporated Cane Juice. N.p., n.d. Web. 20 June 2012. <http://www.processedfreeamerica.org/resources/health-news/405-the-truth-about-evaporated-cane-juice>. "What Is Maltodextrin?" FitSugar. N.p., n.d. Web. 20 June 2012. <http://www.fitsugar.com/What-Maltodextrin-293287>. "Whole Grain Bread Loaf | Udi's." Whole Grain Bread Loaf | Udi's. N.p., n.d. Web. 20 June 2012. <http://udisglutenfree.com/view_product/1015//Whole_Grain_Bread_Loaf>.